Our Christmas appeal gives a Christmas party to children in the preschools at Mae-la camp. This year Corina also ran a second function, an honoring time for her staff and gave small cash gifts to staff who had been with her for 5 years or more. The preschool teachers are only allowed to earn and small wage in the camp so these small monetary gifts really help them to survive. Awards for excellence were also awarded to some of the camp preschools by Corina. The Christmas party is a time of fun. Teachers do funny dances for the children, Karen food is prepared and eatenand a small wrapped gift is presented to each child and songs are sung and the Christmas story is told. 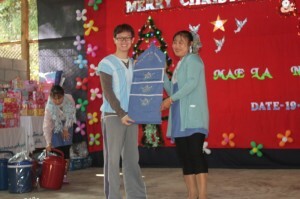 This year over 2080 preschool children participated in this Christmas party. Staff who have served in the preschools for more than 5 years were honored and a great time was had by all. This party was only possible because of the generosity of our donors towards our work in the camp. Thank you. This week we received a letter from Corina thanking us for the funds for these events. Photos are on the way. Corina’s letter is reproduced below. Thank you to all our donors who made this Christmas possible. It brings a lot of joy these kids. 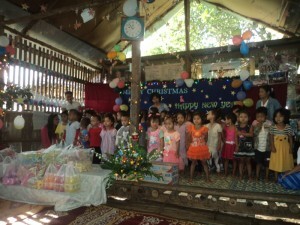 ​I would like to say thank you very much for your love and your kindness to our nursery in MaeLa camp. 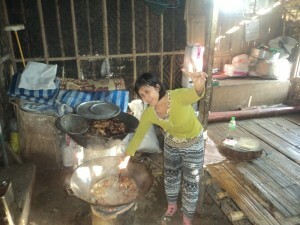 ​We received alot of money from you for chirstmas party. So we used the money and celebrate a big christmas party and for the teacher honouring time for those who have served 5 years and more than . Me and my TOT went to Mae Sot to shopping for christmas party, We got permission from camp commander ,so we used money for travel also. 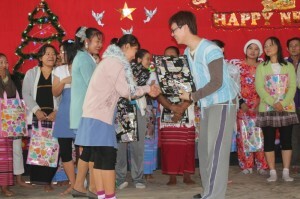 We celebration christmas party at 19.12.2013.ach child and for 45 teachers I gave them 200 baht (about $7.50) for each teacher and 8 trainers , I gave 500 baht (about $18.50) for each trainer. We started with one of the parster prayer. After then we gave honour present to teachers and TOT. And one of the school committee from No-17 was talked about honour and proud of their work to teachers. After the program we started concert and then we ate dinner. So we have a big christmas party with your supported us. ​At last I would like to say again thank you so much for help us and supported our nursery children and teachers in christmas time. We all are wishes you in a New Year, arted concert and then we ate dinner. So we have a big christmas party with your supported us.